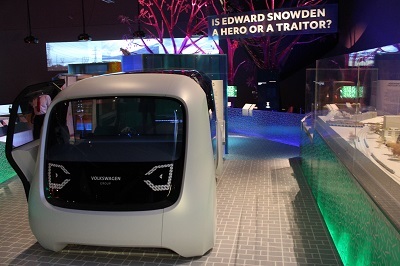 The V&A explores some of the ways that design is shaping the future in the major exhibition entitled The Future Starts Here. 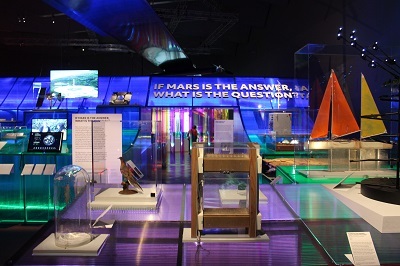 Rather than speculating from science fiction, the exhibition concentrates on science fact by bringing together ground-breaking technologies and designs currently in development in studios and laboratories around the world. Using the latest international research and drawing on a range of companies, universities, practitioners and advisors, the V&A attempts to paint a picture of future developments. 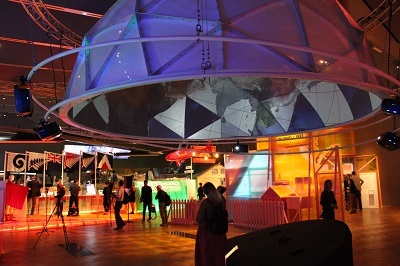 To illustrate this future, the exhibition focuses on more than 100 objects, many of which have never been on public display. The exhibition explores some of the potential impact these objects may have on the body, the home, politics, cities, and the planet and raises a number of ethical and speculative questions and looks at some of the possible consequences. 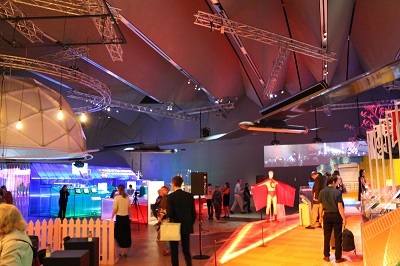 One of the larger objects in the exhibition is the Facebook’s Aquila aircraft, part of a solar-powered high-altitude platform station (HAPS) system which is part of Facebook’s efforts to bring affordable connectivity to unconnected regions around the world. Nearby is Jalila Essaidi’s Living Network project, which imagines a future of the internet as a world wide web of trees. The exhibition is arranged around four main themes that increase in scale: Self, Public, Planetary and Afterlife. The exhibition poses questions such as Are We Human? And we’re all connected but do we feel lonely? this illustrates the general idea that with the advent of smart devices, notions of privacy are changing. However the sharing of our through social media raises questions like increased digital connectivity can lead to solitariness and loneliness in our real lives. Perhaps more positive is the way that technology is being used to enable some people to undertake a variety of tasks. On display is some adaptations that were created for a 70-year-old quadruple amputee to undertake everyday tasks. 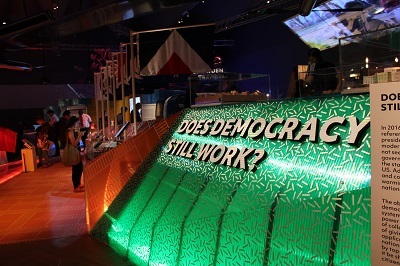 The next section allows visitors to evaluate if democracy still works with projects showing new strategies for collective decision-making and improving public services. 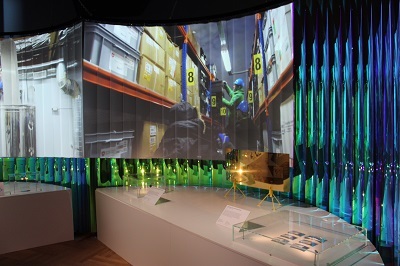 Objects in this section include a full scale model of Luchtsingel, a crowdfunded pedestrian bridge in Rotterdam and the ‘Super Citizen’ suit belonging to Antanas Mockus, former mayor of Bogotá, Colombia. 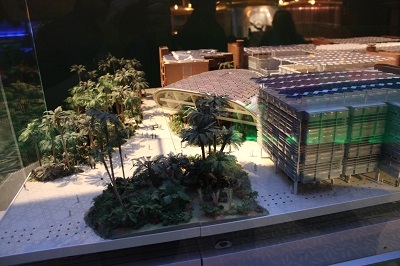 Urban areas face some of the greatest challenges and the exhibition features Foster + Partners’ model of their 6 million m² Masdar City in Abu Dhabi, the world’s first carbon-neutral, zero-waste city, which is shown alongside maquettes of Kuehn Malvezzi’s House of One in Berlin, a three-faith house of worship. Many designers are responding to planetary issues with a number of possible solutions, projects like Tomás Saraceno’s Aerocene Explorer, a solar-powered, balloon-like sculpture uses open-source techniques to collect atmospheric data and Cesar Jung Harada’s Protei which is an un-manned and un-polluting ship that detects and cleans up oil spills. 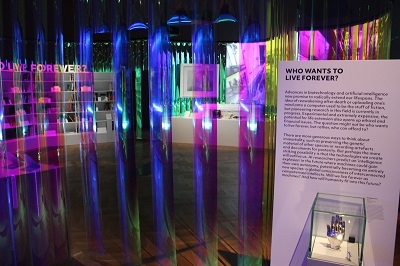 The final part of the exhibition explores some of the initiatives that will safeguard some of the world’s natural resources. Highlights include an architectural model of the Svalbard Global Seed Vault, nicknamed the “Doomsday Vault”, which contains crates of seeds from all over the world, to protect them from natural and man-made disasters. Also on display is an example of the external 5D data storage developed at the University of Southampton capable of surviving for billions of years. These small glass discs are already being used to store major documents from human history, such as the Universal Declaration of Human Rights and The Magna Carta. Even questions of immortality are considered with the idea of Cryonics where people can be stored in liquid nitrogen after death, with a view to being brought back to life in the future. 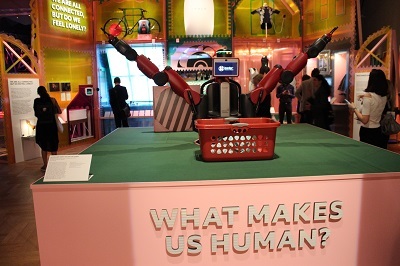 This unusual and fascinating exhibition asks some big questions and looks at some objects that are already providing some possible solutions to some of our pressing concerns. Predicting the future is a notoriously difficult pursuit due to the fact that there are unpredictable and unintended consequences that often changes the paths of development. However it is always useful to consider the future we would like to see and find ways of achieving those goals. 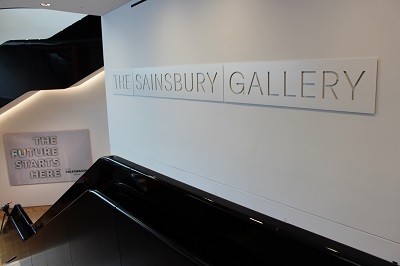 The Future Starts Here will run from 12 May to 4 November 2018 in the Sainsbury Gallery at the Victoria and Albert Museum. By londonvisitors2014 in Exhibitions on May 9, 2018 .